Grundfos hopes that the pumps will extend the performance of the Grundfos Smart Digital range. In order to increase productivity and reduce costs, Grundfos has launched a range of intelligent products under its iSolutions portfolio. 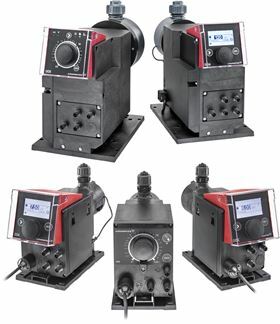 These products include the new Grundfos Smart Digital XL DDA and DDE dosing pumps, which enable chemical dosage across numerous production processes including drinking water, wastewater treatment, and industrial processing. The intelligent monitoring and adjustment features should ensure the safe and economical operation of increasingly complex dosing appliances, preventing leakages and improving cost efficiency. The performance of the two new pump models means customers can reduce chemical consumption by 5 - 19% compared to mechanical dosing pumps. The pumps extend the performance of the Grundfos Smart Digital range, opening up new application possibilities within industry, water utility, agriculture, and more. Grundfos India’s IE5 motor is integrated with a frequency converter. Grundfos recently launched SCALA2, a fully integrated water booster pump. Grundfos and Cambodia’s Ministry of Industry & Handicraft are to exchange a Letter of Intent to strengthen cooperation in water management. Florida-based Holland Pump manufactures, sells, rents and services pumps and related equipment.